Very attractive West Australian shrub. Light grren diamond shaped leaves are arranged scale like on the wiry branches. 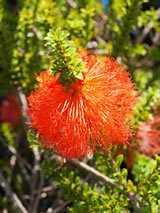 Bush is covered with colourful bright orange-red bottlebrush flowers in late summer and autumn. Prefers a warm site with well drained soil. Thrives if not in a very dry site. Flowers on one year old wood, so only prune straight after flowering.